OK, I will confess that my belief in Russian realpolitikal reason is beginning to be stretched. Until now, Putin has proven a very effective–in his own terms–high-stakes poker player, with a keen sense of when his opponents are bluffing. He has been able to use that to parlay a much greater geopolitical role than Russia’s actual political, economic, military, even moral resources ‘should’ command. Of course, in foreign policy chutzpah is a crucial, if intangible asset, especially when dealing with a European Union that is often disunited and uncomfortable with active interventionism (I have yet to see where the ‘Action’ in the European External Action Service comes in) and a US presidency that appears unable to take a strong line on anything that doesn’t involve drones. My assumption was that Russian moves in the Crimea were primarily a characteristically in-your-face way of bringing political pressure to bear on Kyiv to reach some kind of understanding with the Moscow-leaning elites of the East and also with the Kremlin itself, recognising that Ukraine needed to genuflect to Russian political and psychological concerns. At the risk of sounding increasingly naive, that still may be true. We have seen this weekend a strengthening of Russian forces in the Crimea (notably with paratroopers from the 7th Guards Airborne Division from Novorossisk) and illegal pressure on the relatively few Ukrainian forces there. Further units have been mobilised on the Ukrainian border. Meanwhile, the Federation Council duly voted to grant Putin the right to send forces into Ukraine, but that’s never been a factor before, so perversely I am faintly encouraged by that, in that it smacks more of a political threat rather than a necessary prelude to war. So conceivably, conceivably, there is still scope for a political resolution, one that will allow Putin to pull the boys back, claim victory over a cowed Kyiv and a hand-wringing West, and await the next well-meaning invitation to a “reset” of east/west relations. Let’s face it, the usual pattern is that one will be along in six months or so. After all, and this is something worth stressing amidst all the high-octane journalistic and political rhetoric, so far there has been no Russian incursion beyond Crimea, which while clearly a violation of international law, could be worked out. And yet I wonder if Putin has over-reached himself and under-thought the implications. If Putin either is committed to taking Crimea or finds himself locked into that course of action, it will be an expensive, Pyrrhic victory. The scale and paint-scorching vitriol of Russian media and government rhetoric, the rentamob “defend the Crimea” marches, all this pushes the Kremlin into a position harder from which to withdraw. It has also radicalised Kyiv’s position–Ukraine has understandably mobilised as both political gesture and also practical precaution–and granted it sanctity in Western eyes. After all, let’s not forget that until very recently, while no one in the West mourned Yanukovych’s departure, there were also concerns about the political stability of the new regime, its links with right-wing extremists, the constitutionality of the deposition of the president, etc. Now, to acknowledge any of those would be tantamount to giving comfort to Moscow. What, one might ask, is Moscow’s endgame? What does it want, and how likely is it to get it. The more it radicalises Kyiv, the less likely it is to get some wider political settlement. Instead, it might be forced to take Crimea if for no other reason than that it has to be seen to accomplish something, even if this is a pyrrhic victory, one which will only hurt Russia. Here, after all, is the perverse and twisted irony of the situation. Strictly from a coldly logical position (and I am not advocating this, I should add), in many ways it is in Kyiv’s interests for Moscow to steal Crimea, and turn it into some pseudo-state or new part of the Russian Federation. Ukraine loses a sunny peninsula, but also a distinct drain on the state’s coffers (the Crimean economy is not great, and the region receives net subsidies from the centre). It sheds the most troublesome and Russophile of its regions, one which has been a turbulent locus of trouble for Kyiv for most of post-Soviet Ukraine’s history. It also gets concrete proof of the threat it faces from Russian bullying and probably accelerated and solicitous assistance from the US, EU, NATO, etc. It also validates every Ukrainian fear about Russia. Meanwhile, Russia would face a storm of protest. Now, it has done so before and probably thinks it could weather this easily enough again, but this is not 2008 and Ukraine is not Georgia (not least as Saakashvili overplayed his hand and allowed himself to be needled into firing the first shot). Indeed, outside countries will assess Crimea 2014 in light of Georgia 2008. Of course we won’t see military action (though possibly enhanced NATO guarantees for Ukraine), but considering the example of the Magnitsky Law already present, I’d expect targeted bans and asset-freezes on officials, visa restrictions and even potentially targeted sanctions against Russian corporations. This is already being adverted by the likes as Edward Lucas and Michael Weiss, and I would imagine it would have a great deal more traction if Crimea were forcible wrested from Ukraine. There is no way round it, the most powerful weapon against the Kremlin is one targeting the elites on which it depends. Putin is nowhere near as powerful at home, within the elite, as before. That’s not to say he has any clear rivals, or in imminent political danger, but any serious and sustained campaign to attack his elite supporters’ freedom to travel, invest, bank and shop abroad might well seriously affect this. Let’s be honest, so far the West’s track record in following through and maintaining such efforts has been questionable, but that doesn’t mean it cannot happen in the future, and Ukraine–bordering onto NATO and the EU, after all–might be the necessary cause. So, common sense dictates that this is just an especially muscular and egregious case of Russian sabre-rattling, that ultimately they want Kyiv to cut some kind of a deal (and they’d accept something short of complete submission), and that taking Crimea would actually not be in Moscow’s interests. As the language toughens and the troops roll, though, it’s getting harder to believe that common sense is going to prevail in the Kremlin. Nice analysis, and I would like to agree, but I sense that the Kremlin has actually made the decision to step over the post-WW II established lines of geopolitical behavior. Kremlin officials and pundits love to point to the aggression of the US and its willingness to flaunt these established rules. And just like Iraq turned out to be a tragic mistake for the US, I’m guessing that the Kremlin leadership will come to regret this decision. Thought provoking, comprehensive essay. However, if I may put forth a naïve question: Although you’re accurately described the West’s (so far) lack of will or lack of options vis-à-vis Putin, are there any actions you would recommend the US to take? This is excellent. One note, it’s not just the usual hardline crowd advocating strong response measures. We’re seeing very similar rhetoric coming from folks with a reputation for being relatively pro-Russian, such as Mark Adomanis. I support visa restrictions and asset freezes as well. The analyst community seems more united than ever before on this. And we’re already seeing similar rhetoric from the administration, such as Kerry’s statement on Face the Nation. Of course, this only strengthens your point, but I thought it was worth highlighting. Thanks, yes, it’s interesting just how Crimea seems to have created an unexpected (but welcome) consensus in the analytic/pundit community. We’ll see if policy makers share it! What you’re missing here, Mark, is any discussion of what’s going on in eastern Ukraine. Even acknowledging a certain degree of fiction in “public opinion,” I don’t see how Russia can take or liberate or whatever Crimea, and then ignore similar movements in Donetsk and Kharkov. Would love to read your take on this aspect of this. Consistency is not something that troubles the Kremlin. 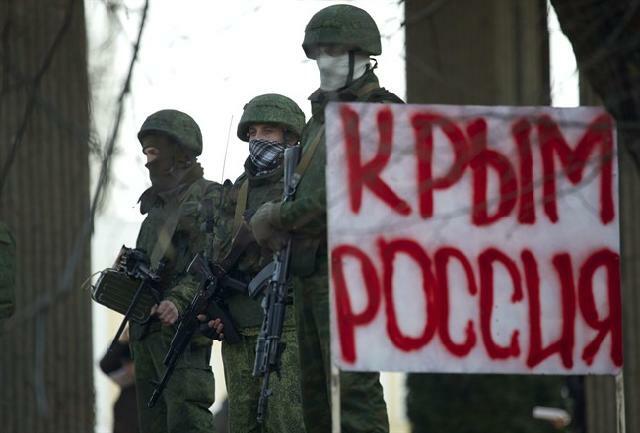 The Crimea is easy; Russian troops already there; near enough no Ukrainians; a defensible peninsula. Doing anything similar in eastern Ukraine means a full-on invasion, against a larger and more capable military than Georgia’s, in a country abutting onto NATO. I don’t think that even if Russia is in true “evil empire” mode it is ready for that. Yes, but how great is the Ukrainian army anyway, and is it really going to want to face the Russians? Except for right-wing radicals like Pravy Sektor (and even they), and with all the Russian media singing the praise of their military power and special units, and considering that the Ukrainian soldiers are probably as divided as the population as a whole — many of them might actually support the Russians (see the recent defection of the navy commander) — is it really going to be a difficult operation? Especially if so many Eastern Ukrainians of Russian origin may well welcome them with open arms, flowers, and little Russian flags? The Americans looked very foolish when they claimed they would be welcomed as liberators by the people of Iraq. In Eastern Ukraine, Putin may well be actually welcomed as one. Is he strong enough to resist the temptation? @Sergio Meira, “open arms, flowers”? Wake up, yo! Did you see the welcoming procession in the Crimean cities? Oh, you mean, few crazy babushkas and retired Soviet army officers as mass support for invasion, right. Putin as liberator?! Oh Mr Putinofile, please, go and have some more vodka shots and play on your balalaika. Mr. Galeotti is behind, far behind events and is seeing it excessively through Moscow specialization. Protests in Ukraine against Putin etc. are occurring everywhere – N, S. E, W and includes both Russian and Ukrainian speaking citizens. The energy and moral force of the Maidan has spread into more of the general population than before. The thugs hired by Ukraine’s 5th column, under orders from Moscow, have been creating the chaos etc. that Russia loves to refer to and that provides one of the excuses for intervention. How do you explain the rush by male Ukrainian citizens to sign up for mobilization? So much so that the military can’t keep up (Dniepropetrovsk and even Odessa). Give Ukraine a mini-Marshall Plan and let that be Obama’s answer to Putin, let that be a re-set. Yes, but there seem to be also spontaneous support movements among Russian-speaking Ukrainians — see the human chain defending the Odessa town hall… What I’m afraid of is that it’s not clear to me how people will divide. Will most Russian-speaking Ukrainians defend Ukraine, or will they believe Putin’s propaganda about their being in danger and needing his protection? I see this in my own family. My mother-in-law, who is a Russian Ukrainian, is very much pro-Putin. She is ambivalent about the Russian soldiers in Crimea, but says they are committing no crimes. Her cousin, also a Russian Ukrainian, is terrified by what she sees in the news and is very much anti-Putin; she supports the Ukrainian army and says she is ready to “do her part”. How many such divisions are there, even inside Ukrainian families? At this point, I find it hard to predict what the general, majoritary, or just average reaction will be. I’m hoping for the best — and I am glad to see all those Ukrainian young men reacting favorably to mobilization — but I frankly still don’t know what to expect. Anything could happen. Including the best, but also the worst. It’s unfortunate that either Russia or Ukraine are in the mist of this crisis. Both Russians and Ukrainians have many wonderful people among them. It will be most tragic if this escalates into a severely deeper crisis, or if any of them are harmed. Today, more than prior conflicts, the world citizenship is far more connected due to the Internet. I don’t know if that is an accomplishment or deterrent, but it certainly gives us a living room focus of what’s going on in the world today and a voice previously unspoken or unheard. Informative blogs like this one gives us more insight into the reality of today’s world. Thanks for the information and opinions. It’s neither a conflict along ethnic lines, nor along language lines. Putin is crazy afraid of Maidan as symbol of people rising against the plutocracy and establishment that hides behind faced of ‘patriotism’. Whether Putin sees his Crimean triumph as a “Pyrrhic victory” will depend ultimately on the West’s response. Already the EU is said to be backing away from sanctions (although that can change). My own suspicion is that Putin has adopted a wait-and-see attitude toward Western threats of sanctions, targeted bans, etc. Putin’s entire policy in eastern Europe now seems to be very reactive, short-term opportunism. As long as in the short term there are no consequences, Putin may decide that he’s winning. While this is really not a comforting thought, I think the best explanation of the Russian response is that it’s the mother of all hissy fits, and highly irrational. As Professor Galeotti notes, this sabre-rattling doesn’t make any sense considering that Russia already had everything it needed from the Crimea. Russia did have a good chance of drawing Ukraine into its sphere of influence again, and unless Putin decides to annex the whole thing (he won’t), the chances of getting western and central Ukraine to ally with Russia are probably going to be nonexistent. On the other hand, there was a real public opinion split in the Ukraine regarding which way to turn before these troubles began; while the EU was preferred to Russia by Ukrainians, the difference really wasn’t insurmountable (around 40-48%, if memory serves). And the help which the EU offered Ukraine for its economic problems was… ahem… rather inadequate, to put it mildly (not that it’s surprising, given how massively incompetent the EU has been when it comes to its own macroeconomic policy). On the other hand, Russia did offer gifts which would help substantially: Ukraine really needs to devalue its currency to get its current account in balance, but its reliance on Russian gas means that a devaluation would cause a massive rise in energy prices, and foreign currency-denominated debts would become harder to service, pushing Ukraine toward bankruptcy. Putin’s offer addressed both these problems, rolling over Ukraine’s debt and making a devaluation much more feasible. In short, Russia could simply act disappointed but amiable, act constructive but use plausible smokescreens not to provide more than token help, wait for the EU to run Ukraine’s economy into the ditch, offer far better deals to disillusioned Ukrainians, and probably pick up the Crimea, and perhaps Ukraine as a whole with far less trouble. Now, perhaps I’m missing some rational reason for Putin’s actions, some ideological or internal-political reason for Putin’s actions, but it seems to me there is none. Any sanctions that hit elites will harm Putin, a large chunk of Ukraine is going to have a fresh reason to turn away from Russia, and foreign policy will become far more troublesome for Russia if everyone becomes several orders of magnitude more paranoid about it. It just doesn’t make sense to do this. I was considering a short write-up on the Ukraine Crisis, but then I found this blog, which does a much better job of that than I would have been able. How about good old clausewitz’ take on the current war? What if Putin being the CinC acts as he should – irrationally. Putin’s main problem with Ukraine is Pshonka’s house. Not Yanukovych’s house, Pshonka’s. If the Russians put two and two together, they will admire Pshonka’s place for its tasteful and restrained decoration when compared with what their leaders have. It sounds like a flippant point, but it isn’t. Amusingly, Yanukovych denied his place was his own, despite the monogrammed golf driver. I agree. I think the backlash of such an audacious move is probably not worth the risk. On the other hand, the hands of the “West” are tied unless/until he makes a move, so he is free to rattle away. I hope for everyone’s sake that there is a peaceful resolution before it escalates any more. Stock market pothole or precipice?